First came the blind auditions. A month of battle rounds followed. When NBC’s top-rated “The Voice” returns next week, the show enters a new, live phase of competition. Here’s how the latest set of would-be pop stars fared on Tuesday’s final night of battle rounds. This week, Adam paired Jeff Jenkins with Casey Desmond, the redheaded dance pop artist. 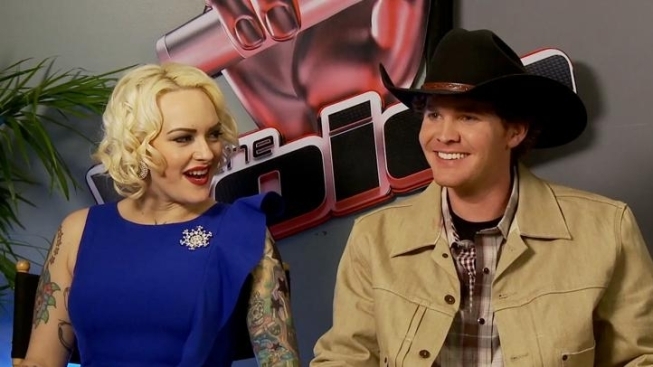 Adam had been the only coach to press his button for Casey during her blind audition, while Jeff was a favorite of all celebrity coaches going into his battle round. Still, Jeff predicted tough competition in the “crazy, awesome rocker.” After singing Elton John’s “Don’t Let the Sun Go Down on Me,” Reba McEntire said she couldn’t keep her eyes off Jeff, while Blake said the same about Casey. Cee Lo said he would give the nod to Jeff, but the decision was up to Adam. After telling Casey she had a “tremendous voice” the Maroon 5 rocker said there was something “mindblowing” about Jeff and advanced him. For battle No. 2 of the night, Blake said he tapped Xenia vs. Sarah Oromchi because both seemed “bashful.” Xenia, 16, revealed she was always “the quiet girl in class” and started crying during rehearsals when Blake praised her voice. After performing “I’ll Stand by You” by The Pretenders, Christina praised Xenia’s tone but said Sarah “had more passion.” She also said Sarah missed notes. Adam seconded that Sarah’s performance was “pitchy and nerves were flying around everywhere,” though he said the song wasn’t a good choice for either performer. Blake said he agreed but “you have to step up to the plate” anyway. He chose Xenia to edge past her rival. Cee Lo went last and paired up Emily Valentine with Curtis Grimes, the baritone country singer who earlier this season performed a Blake Shelton tune. Before they performed Lady Antebellum’s “Need You Now,” Emily revealed she’d become friends with Curtis and had even started to develop a crush on the former baseball player. After their performance - which ended with a passionate kiss - Blake joked that Cee Lo had told the pair to “duet – not do it.” Christina called Emily’s vocals shaky, while Monica said the two singers simply came from “different worlds.” Cee Lo agreed Emily was out of her comfort zone and selected Curtis to advance. Next week the show kicks off its live rounds in a new timeslot, 9 p.m. ET. Celebrity coaches will perform.